"If you don't know your own worth or value, then do not expect someone else to calculate it for you." with focusing on ourselves and the 3 states of mind? Part of living a life worth living is that, that worth is coming from you not those around you. 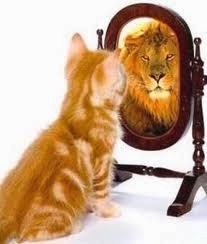 You have to see it in the mirror, you have to give yourself that power. Something that we are all too aware of is that what we say and do, how we behave impacts those around us. So it seems that it is a natural leap that we try and balance us with those around us. While this is natural, it is also very important to keep the proper understanding of that balance. On one side, yes, be very aware of how you impact the world around you, that speaks to accountability. On the other side, how that impact affects those around us after the accountability factor is on them, not you. So you do not define yourself based on what those around you defines you as. Does this make sense? Can you see that fine line that exist between accountability and relying on the approval of the people around you? They are imperfect too, so the problem lies in when you put all of your stock into what your mate is feeling about a situation or if you put all of your worth in what your loved ones think about your journey, you are stealing the power of momentum from yourself and are disabling the ability of your three states of mind to function properly and therefore as a result will find that you cannot access wise mind as often or as effectively as needed. All due to the fact that if something is off with your loved one, it will thwart your ability to see your power to over-come you being off baseline. It is also called codependency and is dangerous. Certainly they are called our support team for a reason, they are to support us. Not, as the quote stated, calculate our value. Support assists, it does not do things for us. In the end, if we use the support properly we will build relationships that we have never experienced before. The strength of the relationship will be amazing! Because it will be based on two people's ability to stand on their own feet and at the same time offer assistance. When we engage in target behavior we are hurting both ourselves and our loved ones. They will forgive us if they see us working through it rather than looking to them to make ourselves feel better. When you fail well, you do it because you used your skills to pick yourself up and keep going. If I say there is a better way to use certain words, does that mean I am saying the way you were using them is wrong or bad? Or is there a dialect there? The words you are using are hurting you mentally and you are doing nothing wrong. I ask that everyone add these two words to their vocabulary and as often as possible use them instead of the words listed above: effective and ineffective. "What I just did was ineffective in reaching my ultimate goal, what can I do that will be more effective next time?" "I will never get this. I did something bad again. What's wrong with me, why can't I get it right?" Do we see the stark contrast? The natural progression of shaming words that follow the negative black and white thinking of words like, never, bad, wrong etc? Versus the natural progression of picking the pieces up when you use words like ineffective and effective? You take all the power of out of the painful words when you use ones that are simply stating the reality. It is almost like you are forced to take a step back and become a commentator to your own life. Once you have realized you have engaged in something that you have been struggling to rid yourself of (target behavior) if you step back and start narrating the events as facts, rather than as the emotion, you are forced to accept that those actions are not anything that can be judged, when does a narrator judge the story? Rather, it is spoken like it is. Did that action hurt you? Yes? OK, that was ineffective. Was that action in support of your goals? Yes? OK, that was effective. Period. End of story. No judgement, no shame, you move along. It is when we shame ourselves that we find that we slip into the codependency of a relationship, we slip into ineffective behavior that is only hindering our progress. This is why DBT's cornerstone of skills is mindfulness. It helps to keep our minds flowing in a positive and effective direction, so that when we are faced with triggers, we will be equipped to face them knowing our own value. Whether we handle it in a way that is effective or ineffective, we will know what to do with the outcome once we are there. Please share your thoughts on this. Next post will be more on mindfulness.